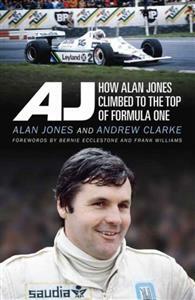 Few names in international motorsport are treated with the same reverence as Alan Jones. When he speaks, they listen. He is one of only two Australians to win the Formula One World Drivers' Championship, and the first driver to do it for the now famous Williams team. His efforts brought Formula One to Australian TV screens, and today he is the voice of Formula One on Network Ten and a board member of the Australian Grand Prix. He is also a Formula One Steward at a couple of Grands Prix a season. AJ is the son of Stan Jones, the winner of the 1959 Australian Grand Prix, and from an early age he wanted to follow in his father's footsteps and race cars. He started with billycarts in Balwyn and climbed to the top of the motorsport tree in Formula One. His career was potted with highs and lows, the latter coming mainly from a lack of financial support compared with his rivals. But when he hit the big time with Williams, he turned that into the 1980 World Championship and all the fame and fortune that brought with it. But he stopped enjoying himself, the cars were painful to drive and he didn't feel he could give it his all, so he quite at the height of his powers. He did return to F1, but he wasn't the same driver and it wasn't the same team and it didn't last. He finished his racing career in touring cars in Australia. His no-nonsense style brought him both admirers and detractors, but he always spoke as he saw it. He still does that today. There are many stories to tell from his racing career, his personal life and business. Some stories that only time allows them to be told.